As our short spring draws to a close, Texans are revving up their a/c units for the long summer weather and heat. Along with other spring cleaning, many companies perform annual or seasonal maintenance on their air conditioning units this time of year. 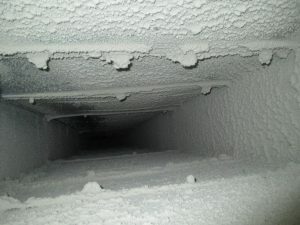 But does your office or building need air duct cleaning this season? In our next three monthly posts, we’ll tell you about the top three signs of problems that your building engineers or air conditioning technicians should look for when they’re performing typical maintenance like changing the air filters. Even if your building has great air filters installed, you’re still going to get some particles that escape the filters and settle into the ductwork. Dust can also build up in your hvac system if you’ve done construction in your office or building, such as replacing carpet or sanding floors. Are you constantly dusting off your computer screen? Do you notice a layer of fine dust on your shelves? Overtime, all that dust that has settled into your ductwork builds up. Then when the air conditioner kicks on, the air flow sends the extra dust all the way out of the ductwork and out of the vent, where it lands on your computer screen, your desk, your shelves. We’ve vacuumed out the dust, then sprayed the metal ductwork with a sealant. The sealant settles into the joints and connectors of the ductwork and reduces any air leakage seeping out of the ductwork. Instead of leaking out of the ductwork into the space above your office, your air will be directed to where you want it to be coming out: through your air vent! 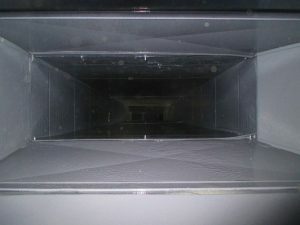 When your building engineer or technician is changing out the air filter on your a/c unit, that’s a great time to take a look into the ductwork to see if you have an excess dust problem beginning. You can also watch out for this yourself by watching out for the amount of dust that you’re seeing around your building. Stayed tuned next month, when we’ll tell you about another common issue in ductwork: Visible Mold Growth!